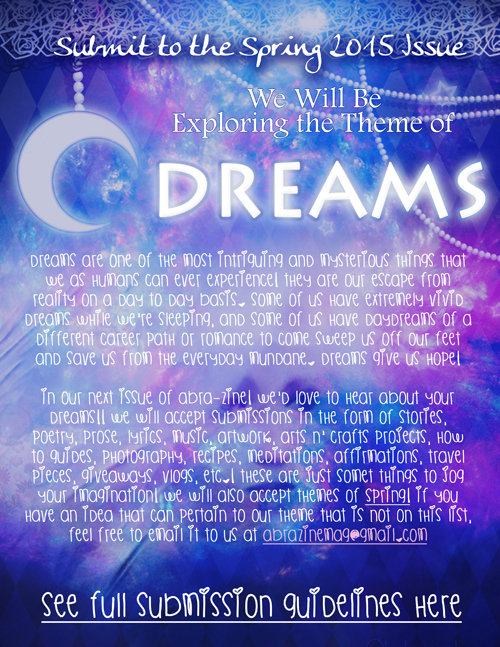 2015 SPRING DREAMS ISSUE COVER AND FULL CONTRIBUTOR LIST! DOWNLOAD the Abra-zine 2015 Winter Angels Issue NOW! GO TO OUR DOWNLOAD PAGE NOW! Thanks to all of my awesome contributors once again for making this a great issue! Now Accepting Submissions for our January 2015 Angels Issue! 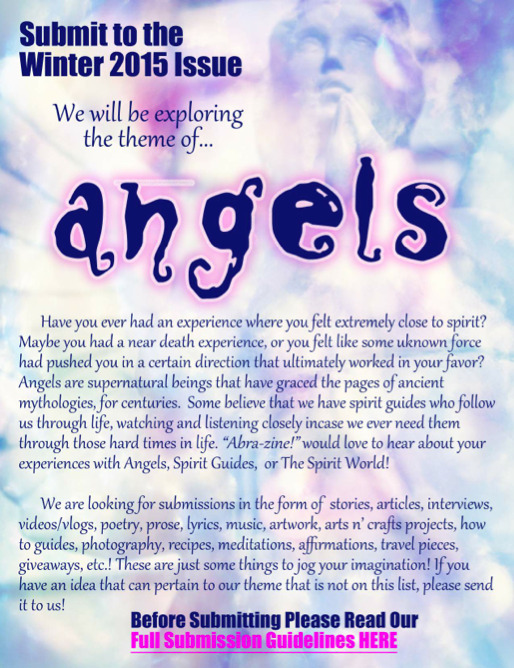 SUBMIT NOW to our January 2015 ANGELS issue! 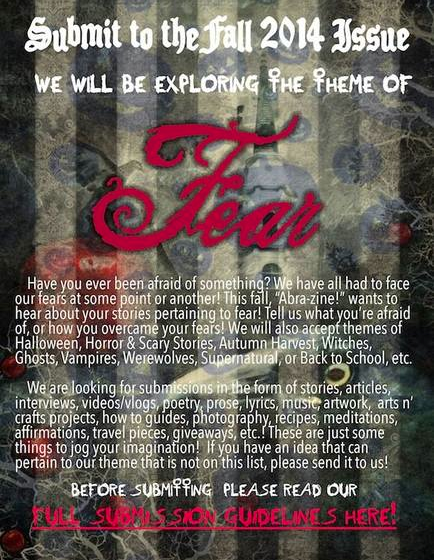 FALL 2014 FEAR ISSUE COVER RELEASED! (COMING THIS OCTOBER!) & CONTRIBUTOR'S LIST! My Artwork For Sale on Products on Society 6 Marketplace! Buy my newest zombie sugar skull collection on all kinds of cool products on Society6!! There are laptop & iphone cases, tote bags, coffee mugs, throw pillows, and framed art prints! I'm getting SUPER EXCITED for Halloween and EVERYTHING the Autumn season has to offer!!! I'm already having some awesome ideas for stories for the upcoming Fall Issue!!! I can't wait to start working on things! You can download it here now! Remember Deadline is September 1, 2014!! FALL 2014 SUBMISSIONS NOW OPEN! 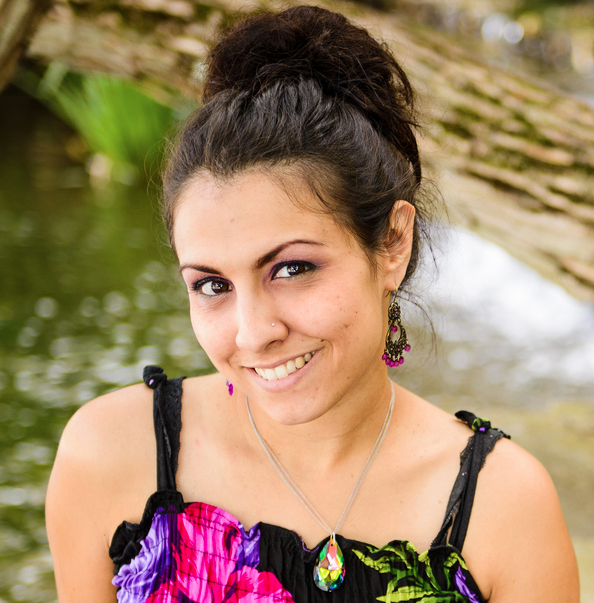 I'm the Spotlighted WILD SISTER OF THE MONTH in This Month's Issue of Wild Sister Magazine! DL Your FREE Copy NOW for a Limited Time Only! I'm the FEATURED WILD SISTER OF THE MONTH in this month's July Issue of Wild Sister Magazine! I am SO beyond honored to announce my spotlight... Thank you so much to editor in chief, Jenn Saunders and the whole team at WSM for asking me to be a part of your issue! This mag represents such strong, likeminded creative women... I couldn't be more proud to be a part of this tribe. READ MY 5 PAGE SPREAD IN THIS ELECTRONIC PDF ISSUE NOW!! 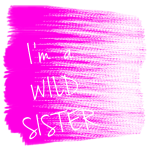 THIS ISSUE IS FREE IN CELEBRATION OF WILD SISTER’S 3RD BIRTHDAY! THIS ISSUE IS FREE FOR A LIMITED TIME ONLY! AFTER AUGUST 4, 2014, IT WILL BE $5.OO TO DOWNLOAD!